One of the more unusual however easily recognisable Australian trees is Brachychiton rupestris tree commonly called the Queensland Bottle tree. We could call it an iconic Australian tree. 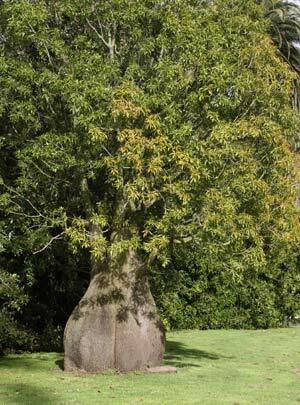 The trunk is the feature, bulbous and with a textured bark, and yes it is shaped like a bottle. (picture right) Young trees do not have the pronounced swelling in the trunk, however in older trees the trunk is very broad and swollen. Like all trees it does flower however these are insignificant, the flowers are followed by large woody seed pods. Evergreen or semi evergreen depending on climate, dense deep green foliage provides shade in summer. Flowers are really insignificant, small yellow and pretty, but not the main feature. Brachychiton rupestris will reach around 10m to 20 m depending on conditions. A well drained humus rich soil is best however these plants are fairly hardy once established and require little care, they are mostly pest and disease resistant and drought tolerant once established. Although Brachychiton rupestris is from Queensland, it grows well as far south as Melbourne and some specimens are seen in Tasmania. The root system is regarded as being non invasive which makes it useful in a range of situations. The growth rate is regarded as slow over the first few years, the swollen trunk will take around 5 – 9 years to develop into a feature. Because of this landscapers look for advanced specimens are available for sale. Some advanced bottle trees will have trunk diameters of 2m +. Specialist tree transplanters are required to move these trees. Fertilize young plants with a low phosphate Australian native plant fertilizer. Once established the Bottle Tree is regarded as drought tolerant. Height is to 20 meters, however this is for very old specimens in their native habitat. Excellent in larger parks and gardens, public spaces including schools. seedlings can be grown in containers, however they will eventually need to planted into the garden. Common Name – Queensland Bottle Tree, Narrow leafed Bottle Tree. Height – To 20 metres over time. Width – Will form a broad dome to 12 metres in good conditions. Soil type – Tolerates a range of soils, good drainage is important. Water requirements – Drought tolerant once established. Frost – Susceptible to frost damage when young. Foliage – Mid green, and narrow leafed, the bottle tree will drop its leaves just before flowering. Propagation – Plants can be propagated from seed. Many specimens are transplanted with very good survival rates.